An excellent and precise-fit, but like most skater-style helmets, its heavier weight can make it tiring to wear. BEST FOR: Riders in need of a dual-certified helmet who bounce between their scooter, skateboard, and bike. Is a more expensive kid’s helmet really worth the cost? The short answer is yes! Like most things in life, you get what you pay for, and the same was true in our comparison of the Bell Span, Bell Block, and Kazam skater-style kids’ helmets. 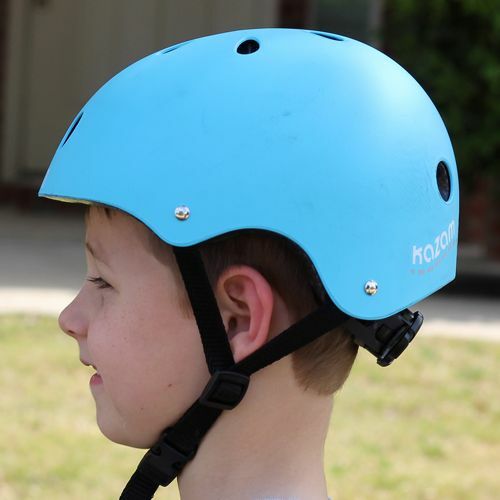 The Bell Span is a high-quality helmet that adjusts easily to fit your child's head and stays in place! With full front, side, and back coverage, soft internal pads, and plenty of colors to choose from, this helmet is a winner for parents and kids alike! The Bell Block is essentially the Bell Span, but without the dial-adjust system. While we always prefer helmets to have well-designed dial adjust systems, if you're looking to save $20, this helmet still fits great and stays in place once you adjust the thickness of the internal pads correctly. The Kazam is one of the least expensive skater-style helmets on the market, but has many limitations. While it seems awesome to get a dial-adjust system for such a low price, the helmet frequently did not stay in place on our testers' heads, partially because the helmet is much wider than the Bell models. For a more consistent, accurate fit, consider spending the extra $10 for the Bell Block. Size: One piece of simple advice – measure the circumference of your child’s head! Helmets are not one size fits all. If a helmet is too big for your child, it won’t stay in place during a fall and won’t do your child any good! Coverage: The more coverage a helmet has, the more it can protect your child’s head in the event of a crash. Both the Bell Span and Bell Block offer thorough back, front, and side coverage. One of our primary complaints about the Kazam helmet was the limited coverage, as compared to the Bell models. Just as important as buying the right size of helmet is buying a helmet that can adjust to fit your child’s head properly. If the fit isn’t snug enough, a helmet can shift during a crash and fail to provide proper protection. 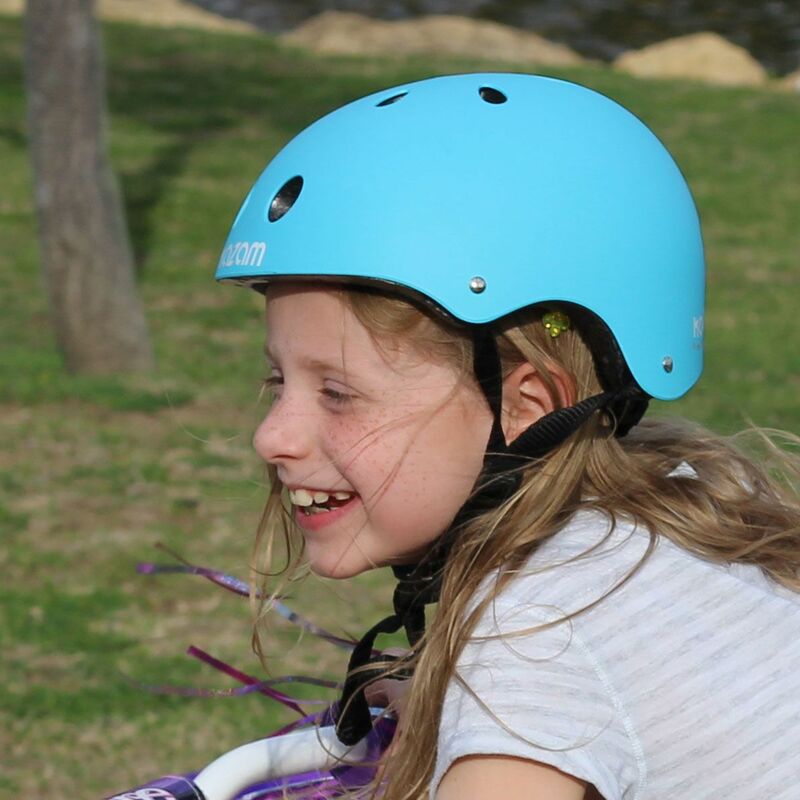 Bell Span: The clear winner in this category is the Bell Span with its high-quality dial-adjust system that quickly and easily adjusts the back of the helmet to fit your child’s head. Like the majority of dial-adjust systems, the Span only adjusts from the back (pushing your child’s head forward). Along with the dial-adjust, the width of the helmet is relatively narrow, and the internal padding doesn’t shift around. These combine to make a helmet that fits snugly and stays in place. The internal padding is a high-quality, soft textured fabric that has sealed edges to prevent any sweat that is collected from dripping in your child’s eyes. The advantage of pads with textured fabric is that there is less direct skin contact, which leads to less SWEAD (sweaty +head), as our family calls it! Bell Block: The primary difference between the Span and the Block is that the Block does not have a dial-adjust system. As is typical for many skater-style helmets, the Block comes with 2 sets of front pads and 2 sets of rear pads (a set of thick pads and a set of thin pads) to manually adjust the internal size of the helmet. While the initial set-up was a pain, once we got a tester fit properly, it really wasn’t a problem. However, it WILL be a problem if you have siblings sharing helmets and you need to quickly adjust the helmet’s fit. Additionally, if your child’s head is on the smaller side and you start out with the thicker pads, it’s very likely you won’t be able to find the thinner pads as your child’s head grows! The pads are soft and of good quality, and also sealed along the edges to prevent sweat from dripping into your child’s eyes. Kazam: The Amazon best-seller offers a dial-adjust system that is easy to use, but the helmet frequently fails to stay firmly in place. The helmet is wider on the sides than the Bell helmets, and given the dial-adjust only tightens from the back, the Kazam isn’t nearly as precise a fit as either the Span or the Block. Our testers regularly came back from short rides with the Kazam helmet off-kilter on their heads. One of our testers was actually able to pull the Kazam completely off the back of his head with the chin buckle still engaged. The problem this poses is that kids get hot and sweaty heads and want to cool off. In this case, a child could actually push the helmet out of place to get some air, and then ride around without putting the helmet back in its proper place. A helmet cannot properly protect your child if it’s not firmly in place. Strap Sliders: How well a helmet stays in place is also determined by whether or not the sliding adjustors on the side straps stay in place or come loose regularly. The Bell Span and Bell Block strap sliders were tough to slide up and down (in a good way! ), while the Kazam sliders slid up and down quite easily, which means they are more apt to loosen on their own. All three models we tested have standard style buckles that can easily cause pinching when fastening together or taking off. While this is industry standard, there are some brands of skater-style helmets that offer unique “no-pinch” systems. If you want to avoid any pinching crying sessions, you should check out the Nutcase Little Nutty or Melon helmets. One disadvantage of skater-style helmets is that they are typically much heavier than standard helmets. While a standard helmet generally weighs 250 – 300 grams, a skater-style helmet will usually weigh over 400 grams. Heavier helmets are obviously less comfortable to wear for long periods of time and may result in kids wanting to take them off while they are still riding. Not all skater-style bike helmets are certified for skateboard use. 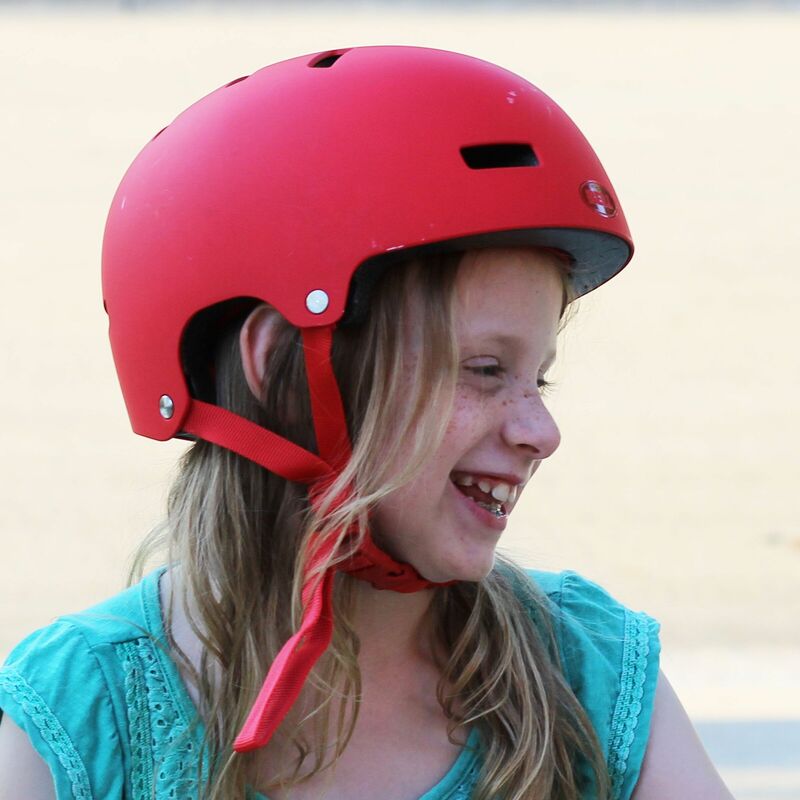 Unless a skater-style bike helmet is dual certified for bike use (CPSC) and skateboard/scooter use (ATSM), it is NOT safe for your child to use for both activities. Both the Bell Span and Bell Block are dual certified. The Kazam helmet is NOT dual certified – it is only certified for bike use (CPSC). 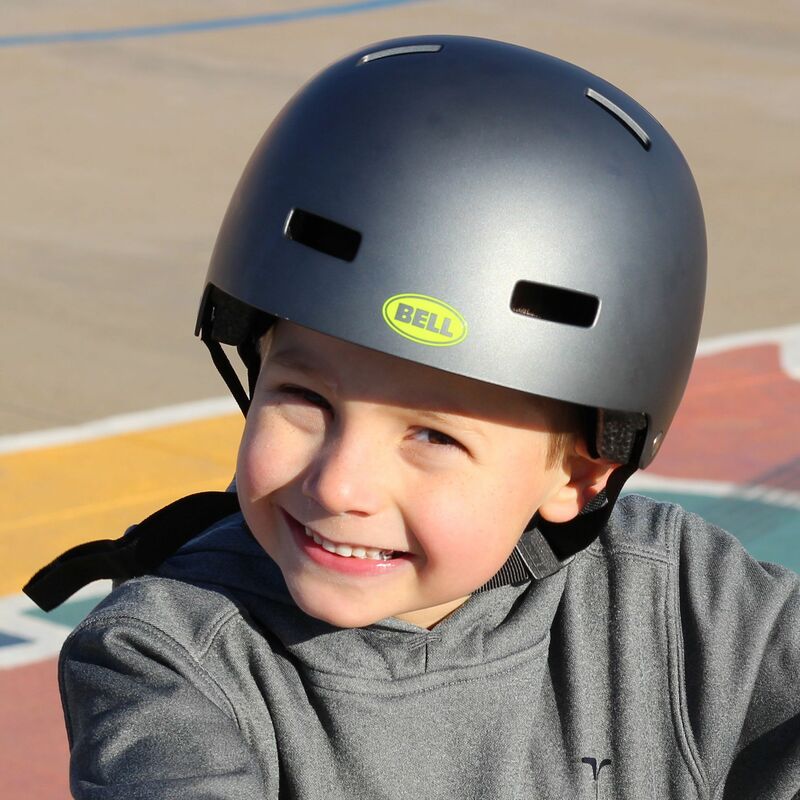 If your child is insisting on a skater-style helmet, both the Bell Span and Bell Block are high-quality helmets that will serve your child’s noggin well! We also recommend taking a look at our favorite skater-style helmet, Melon. It’s only about $10 more than the Span and is much lighter-weight. If your child has a wide head, the Kazam might stay put for them, but otherwise, it’s not your safest bet. To view an even wider selection of helmets, check out our Kids’ Helmets Comparison Chart and Ratings page.